Soybean oil, the vegetable cooking oil commonly used in the United States, is also gaining popularity worldwide. Researchers at the University of California, Riverside (UCR) tested a genetically modified (GM) soybean oil used in restaurants, and found that while it induces less obesity and insulin resistance than conventional soybean oil, its effects on diabetes and fatty liver are similar to those of conventional soybean oil. 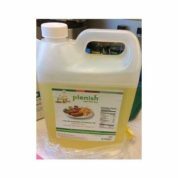 The researchers tested Plenish®, a GM soybean oil released by DuPont in 2014, engineered to have low linoleic acid, resulting in an oil similar in composition to olive oil, the basis of the Mediterranean diet and considered to be healthful. The study also compared both conventional soybean oil and Plenish® to coconut oil, which is rich in saturated fatty acids and causes the least amount of weight gain among all the high-fat diets tested. The research team also compared Plenish® to olive oil. Both oils have high oleic acid, a fatty acid believed to reduce blood pressure and help with weight loss. They found that olive oil produced identical effects as Plenish® – more obesity than coconut oil, although less than conventional soybean oil – and very fatty livers, which was surprising as olive oil is typically considered to be the healthiest of all the vegetable oils. “Plenish®, which has a fatty acid composition similar to olive oil, induced hepatomegaly, or enlarged livers, and liver dysfunction, just like olive oil,” said Poonamjot Deol, co-first author of the research paper. For more details, read UCR Today.